While Rome's chattering circuit is consumed with the latest round of leak theatrics surrounding Vatican finances and the excesses of some prelates, the Pope has instead taken to doubling down on work and complete a "lightning round" of appointments to several major European posts. A protege of Leonard's predecessor, the famously liberal Cardinal Godfried Danneels – whose auxiliary De Kesel had been from 2002-10 – the archbishop-elect (a Gregorian-trained theologian) was the first choice on the terna for the last Brussels succession, but the then-Nuncio, Archbishop Karl-Josef Rauber, was overruled by Benedict XVI, who personally chose the more traditional Leonard. Shortly after the appointment and his retirement shortly thereafter, a clearly displeased Rauber himself disclosed the face-off in an Italian magazine interview, going on to criticize both Papa Ratzinger and his eventual pick. Now 81, as a coda it bears noting that the former Nuncio was given a non-voting red hat by Francis at last February's Consistory. In today's other major move, Francis has reportedly spurred shock in the Spanish church's Establishment by tapping 69 year-old Bishop Jose Omella of Calahorra as archbishop of Barcelona, Spain's second-largest diocese, ground zero in the ongoing fight over independence for Catalonia, the region based in Gaudí's city, where the 2010 dedication of the architect's Basilica of the Sagrada Familia provided one of the monumental moments of the last pontificate. 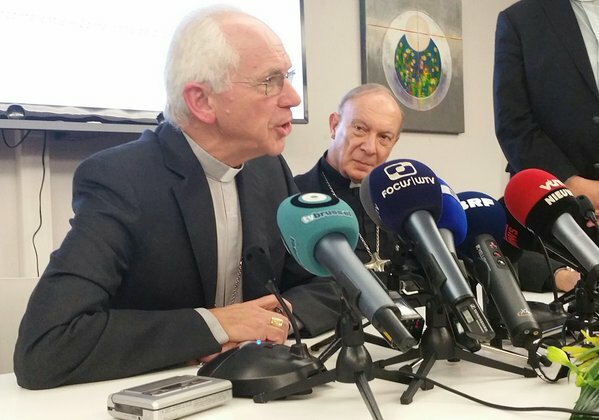 Named to succeed the native son Cardinal Lluis Martinez Sistach, now 78, according to local reports Omella was raised on the peripheries of the region and grew up speaking its distinctive Catalan tongue, but isn't said to be given to his new fold's widespread nationalist tendencies. In keeping with Francis' usual identikit for his picks, the Barcelona nominee has a long history in the church's social action work, including a stint as a missionary in Zaire. The Pope's move on the 2 million-member archdiocese is Papa Bergoglio's third major shift in Spain – whose hierarchy he knows well, having preached one of its retreats before his election – following last year's bombshell appointments on the same day to Madrid and Valencia, the latter going to Rome's then-Liturgy Czar, Cardinal Antonio Canizares. Today's moves close out a cycle of top-level nods which began last week as – in his first turn at Italy's traditional "cardinalatial sees" – Francis yet again stunned the natives by naming an auxiliary of Rome, Bishop Matteo Zuppi, 59, as archbishop of Bologna and a 53 year-old Sicilian parish priest, Msgr Corrado Lorefice, (above) to the archbishopric of Palermo, the island's premier post. 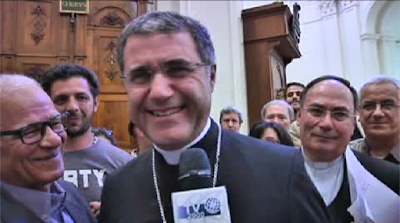 As with today's appointees, both have significant records of pastoring the church on the margins, with Zuppi – a lead figure in the progressive Sant'Egidio movement – having led one of Rome's largest outskirt parishes, while Lorefice has frequently cited his inspiration in the figure of Fr Pino Puglisi, a searing critic of Sicily's Mafia bosses who was gunned down outside his church in 1993. Beatified in 2013, "Don Pino" is buried in the cathedral where Lorefice will soon have his seat. When the assassinated cleric's name was raised following his appointment, the archbishop-elect interjected to reporters that his selection was Puglisi's "fault." In both appointments, meanwhile, it is understood that the Pope tossed aside the shortlists compiled during the formal consultation process, choosing instead to find his choices after taking his own soundings among the clergy of each place. Given his determination to not be "chained" to the custom of certain dioceses nearly guaranteed a spot in his Senate, as Francis has chosen to send his Italian red hats to places which have never had a cardinal or not seen one in generations, whether the duo will follow their respective predecessors into the College is an open question. In any case, while a February Consistory is again said to be on-deck, the mid-month timeframe when Francis has gathered the cardinals both in 2014 and 2015 is off the table next year due to the Pope's now-confirmed trip to Mexico, during which the first American pontiff is widely expected to make his long-desired stop somewhere along the US border... and possibly cross over it.